1/4 cucumber, 50 gr watermelon, water, white wine vinegar, salt and pepper, oil from the sardines). Wash and chop the vegetables and the watermelon, mix in the bread crumbs and cover with water. Refrigerate for 12 hours or overnight. Blend in a food processor and dress with salt, pepper, the oil from the sardines and vinegar. Strain and chill. 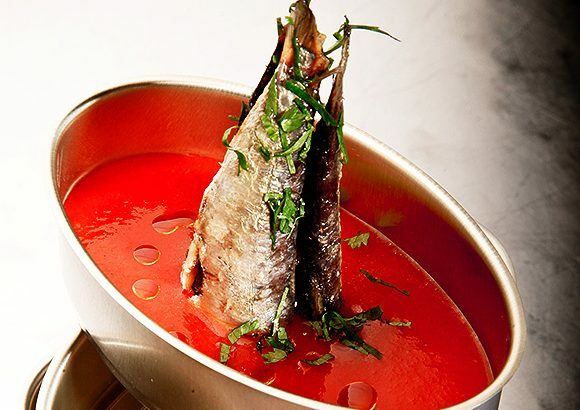 Pour the gazpacho in bowls and add the sardines in an attractive fashion on top of the soup. Top with chopped cilantro.